No7 have literally been firing out new product releases left right and centre for the past few months. First of all it was their Exceptional Definition Mascara, then the new and improved Instance Radiance Foundation followed by the Exquisite Curl Mascara and now we have the new Limited Edition Spring Colour Collection and the product which is in today’s hot seat…No7 Beautifully Matte Foundation. 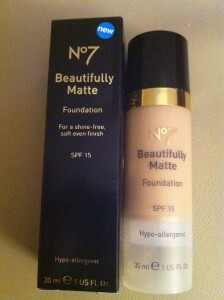 I feel a little sorry for No7 Beautifully Matte as it was initially met with a rather stormy response from fans of the now discontinued Intelligent Mousse Foundation (which it has now replaced). Despite the initial moans and groans, most of these women are now seemingly eating their hats as Beautifully Matte has proved to be a huge hit! If you hadn’t already worked this out for yourself, the aptly named Beautifully Matte promises to keep you shine free for up to 12 hours, whilst balancing oil production and minimising the appearance of blemishes. Though it is a little over ambitious of No7 to say it will last an entire 12 hours it does have fantastic staying power and the colour manages to stay true and look fresh for a decent amount of time. Claire:I have been using Beautifully Matte now for 3 – 4 weeks as my everyday foundation. It has really good staying power, is nice to apply and is also really moisturising (have found that some matte foundations are chalky and drying). Great find for my normal-oily skin and would definitely repurchase and recommend.